322 pages | 30 B/W Illus. This book focuses on social transformations as one of the central topics in the social sciences. The study of European social transformations is very valuable in the context of universal discussions within social sciences: explaining invariable, universal attributes of societies and examining changing attributes. The book consists of 20 chapters on European social transformations, written from the perspectives of distinguished scholars from such disciplines as economics, political science, educational science, geography, media and communication studies, public management and administration, social psychology and sociology. The temporal and spatial range of the book is wide, including such global changes as time-space compression, focusing particularly on change processes in Europe during the last two decades. The book consists of four main parts, beginning with an overview of the theoretical and methodological approaches, and then focusing separately on post-communist transformations, institutional drivers of social transformations in the European Union, and European transformations in the context of global processes. The book presents current theoretical, empirical and methodological approaches that complement the scientific literature on social transformations. This book is both an invaluable resource for scholars and an indispensable teaching tool for use in the classroom and will be of interest to students, academics, and policy-makers studying how this diverse region has changed over recent years. "The epoch of neo-liberalism since the late 1970s has been a period of fundamental social transformations leading to shifts in all areas of society. 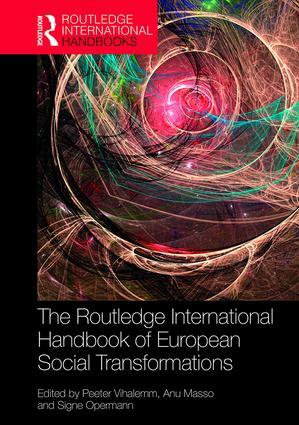 The editors of this path-breaking handbook have assembled a team of scholars, who examine the social, institutional, spatial and temporal dimensions of social transformation as experienced in Eastern Europe and the European Union, and link these both to social theory and to global processes of transformation. This is an important book that could help reframe the social sciences for the 21st century." Stephen Castles, University of Sydney, Australia. "A comprehensive and up-to-date coverage of transformation studies, reaching out from post-communist "transitology" to structural changes of the EU and global capitalism, including both macro, meso, and micro level research. A must-read for specialists and students as well as general readers interested in the epochal change the world is undergoing." Pekka Sulkunen, University of Helsinki, Finland. Peeter Vihalemm is a professor emeritus in media studies at the Institute of Social Studies of the University of Tartu (Estonia). His main research areas are post-communist transformation and changing media use in Estonia. His publications include the book Estonia’s Transition to the EU: Twenty Years On (co-edited with M. Lauristin, Routledge, 2010). Anu Masso is a senior researcher at the Institute of Social Studies at the University of Tartu and a researcher at the Chair of Sociology / Social Networks at ETH Zürich. Her research focuses on social transformations through the prism of spatial mobility, such as mobility practices (e.g. activity spaces), mobility attitudes (e.g. the role of media in constructing immigration attitudes) and media mobility (e.g. the role of smartphones in constructing perceptions of social space and time). Her special passion is research methods in social sciences. She has published in international journals: Journal of Ethnic and Migration Studies, European Societies, Geopolitics, Journal of Baltic studies, etc. Signe Opermann is a post-doctoral researcher in media sociology at the Institute of Social Studies, University of Tartu (Estonia). She earned a PhD in media and communication studies at Södertörn University in Stockholm (Sweden). Her research includes studies on social generations, social and personal time, media use and repertoires of news consumption. Her publications include articles in Northern Lights: Film & Media Studies Yearbook (2013) and Social Space (with A. Masso and V. Eljand, 2014). She has co-authored book chapters in edited volumes.